The Real Estate Market is so fast-paced these days; it takes real effort to keep up, even as a tech-savvy agent. Since technology seems to be speeding up transactions in the market, you can use it to your advantage as well. 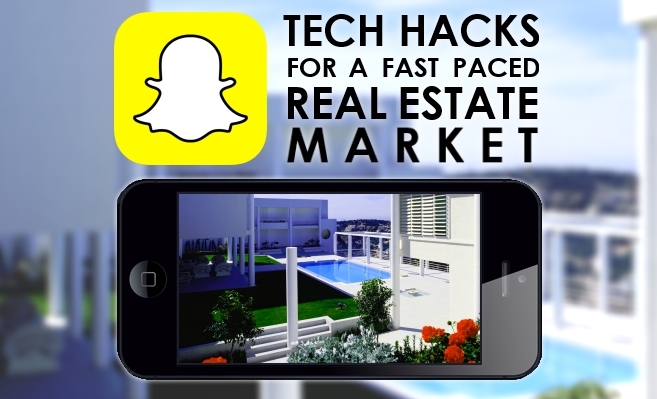 Here are three tech hacks that will keep you up to speed in today’s fast-paced market. Social media is everywhere. And if you haven’t signed up for most of the platforms out there, you’re already behind. Even if you don’t use certain apps like Snapchat or Instagram for personal use, social media for professional use is only becoming more relevant. With certain social apps, it's easier to keep in touch with your clients and easier for them to share your information with their friends and family. Many real estate businesses and agents, like our client Peter Lorimer, are using Snapchat to show their followers the behind the scenes of an open house or to remind them of their favorite new listings. If you want to catch the eye of millennial buyers, it’s better to have a solid social media presence. Sooner or later they will be the driving force behind the housing market, and you don’t want to be left in the dust when it happens. If you're just getting started, here's a helpful guide to Social Media. Another great tech hack is to sign up for alerts, many websites let you sign up for alerts and RSS feeds but there’s also Google Alerts, which you can use to find out what’s being said about you, your company or your listings online. It’s easy to keep track of everything using alerts and the sooner you know of any changes, the better. The market moves so fast now and technology only boosts the speed. So to stay in the know, you need information lightning fast too. Just make sure you set up alerts with websites that are MLS integrated to get updates regularly throughout the day. Keeping viewers interested in your website is a struggle these days. People decide very quickly whether they want to continue looking at your website or if they are ready to move on. Same goes for property websites and social media. A great way to increase the amount of time buyers spend on your website is to include video integration. Videos capture the attention of buyers, according to Forbes “the average user spends 88% more time on a website with video” and “64% of consumers are more likely to buy a product after watching a video about it”. Since most home buyers start their search online, move your listing’s “curb appeal” online too, with a virtual tour to go along with those HD photos. Just take a look at how we integrated video into the website we created for our client The Boutique RE in Corona Del Mar! If you need additional help with video and social media on your broker or agent website, call SM Sold today for a free consultation at (714) 546-7033.